Minnesota progressives can tout a new achievement: the state was recently ranked the best run state in the nation, according to a 24/7 Wall Street report published by USA Today. This report is not based on an ideologically skewed methodology designed to prefer blue states over red states or vice versa, but on a wide array of legitimate measures of economic prosperity and fiscal responsibility. Some of the specific measures used in the report are examined below. Amounts cited represent North Star’s attempt to reconstruct the data used in the report based on information from the U.S. Census Bureau, the Bureau of Economic Analysis, the Bureau of Labor Statistics, and other sources. To gauge the “strength of each state’s economy,” the 24/7 Wall Street report examined 2016 real (i.e., inflation-adjusted) Gross Domestic Product (GDP) per capita and growth in real GDP from 2015 to 2016. On both measures, Minnesota ranked high, with real per capita GDP of $54,414* (7.3 percent above the national average and 12th highest among the fifty states) and a real GDP growth rate of 2.2 percent (significantly above the national growth rate of 1.5 and the 11th highest in the nation). Since the end of the Great Recession in 2009 (beyond the period examined in the report), Minnesota real GDP has increased by nearly 20 percent—the seventh highest in the nation. Minnesota’s high ranking in the report is also based on the state’s high median household income, which was $65,600 in 2016—13.9 percent above the national average and the 13th highest among the states. Since the end of the Great Recession, Minnesota’s real median household income has increased by 5.4 percent—more than double the national average (2.6 percent). Minnesota’s strong performance in terms of income and GDP growth is particularly noteworthy, given that there is a tendency for high per capita income states—such as Minnesota—to have somewhat lower rates of income and GDP growth. This is because high income states do not perpetually run away from the rest of the pack; rather, through the diffusion of technology, innovation, and capital, there is a tendency for somewhat higher growth rates among low per capita income states. The fact that Minnesota has been able to buck this trend and continue to enjoy above average income and GDP growth despite enjoying above average income and GDP levels to begin with is a further sign of the strength of the Minnesota economy. Below is a partial list of some of the other economic and social indicators examined in the 24/7 Wall Street report and the U.S. and Minnesota values for each. For the most part, Minnesota is above the national average where it is good to be above (e.g., school attainment rates, median home values) and below the national average where it is good to be below (e.g., home foreclosure rates, poverty rates). There are two exceptions to this rule: the five-year change in median home values and the five-year labor force growth rate. From 2011 to 2016, median home values in Minnesota grew at a pace somewhat below the national average; however, more recently—from 2015 to 2016—median home values in Minnesota grew somewhat more rapidly than the national average. In short, there is no real indication of significant underperformance in Minnesota home value growth relative to the rest of the nation. Minnesota’s labor force grew less rapidly than the national average from 2011 to 2016. However, this needs to be interpreted in the context of two facts. First, Minnesota’s current labor force participation rate (70.5 percent) is the second highest in the nation and well above the national average (62.7 percent); Minnesota’s high participation rate restricts the ability of the current labor force to grow, since the pool of available workers is smaller than in other states. Second, the somewhat arbitrary period of 2011 to 2016 makes for a worst case scenario for Minnesota relative to other states, since it excludes the period from 2007 to 2011, when Minnesota’s labor force increased three times more rapidly than the national average, but includes 2012—a year in which Minnesota’s labor force showed virtually no growth and woefully underperformed the national average. Since the beginning of the Great Recession in December 2007 through October 2017, Minnesota’s labor force growth exceeded the U.S. average. 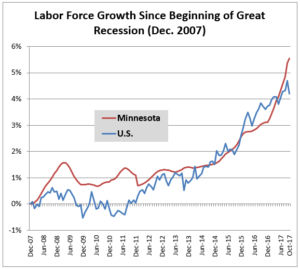 If some year from the last decade other than 2011 had been chosen as the baseline year for the 24/7 Wall Street analysis of labor force growth, Minnesota’s performance relative to other states would have improved. Even using the 2011 baseline year, Minnesota’s performance in other criteria used in the report was sufficient to garner the number 1 spot. Minnesota’s performance in terms of many of the factors cited above was driven by factors other than the decisions of state policy makers. However, another set of factors examined in the 24/7 Wall Street report is more directly related to state policy choices. For example, the increase in the state budget reserve is cited as one of the reasons for Minnesota’s number 1 rank. The increase in state revenue and the resulting budget surpluses also contributed to Minnesota’s strong credit rating—another positive factor cited in the report. Recent increases in education funding—which reversed a decade-long trend of state disinvestment in both E-12 and higher education—is also cited as a positive factor by 24/7 Wall Street. These developments are the direct result of the 2013 decision of state policymakers to enact a progressive tax increase, which restored solvency to the state budget, ended the era of perennial general fund accounting gimmicks, and allowed for new investments in critical state assets. These decisions no doubt played a role in Minnesota’s improved ranking in the 24/7 Wall Street report, from tenth in 2012 to first in 2017. While Minnesota’s position as the “best run state in the nation” is great news, there are some dark clouds on the horizon. Largely as a result of huge tax cuts enacted earlier this year, a deficit in the state general fund is anticipated in the current and upcoming biennia. In addition, the failure of state leaders to enact pension reforms in 2017, legislative efforts to defund the essential functions of the Minnesota Revenue Department, the failure to enact funding for the state legislature, and atypically high levels of friction between the legislative and executive branches all contribute to a sense of dysfunction which could undermine Minnesota’s reputation for responsible governance. Nonetheless, Minnesota—at least for the time being—holds the title as the best run state in the U.S. This achievement is in no small part the result of responsible leadership which shored up state finances through a progressive tax increase that also made possible renewed investments in critical public services. *The U.S. Bureau of Economic Analysis expresses real per capita income levels in constant 2009 dollars.